I posted IFON on the blog not that long ago when it traded at 1.54. It is now at 2.92 incredibly. I have another short sell watch. The same kind of setup as CDTI that I posted on awhile back. 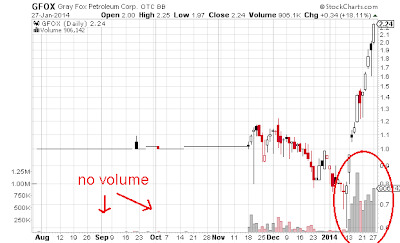 The ticker is GFOX and the company is Grey Fox Petroleum. It trades on the OTC and I'm not sure there are currently any shares available anywhere to short. This is a good short setup forming though. 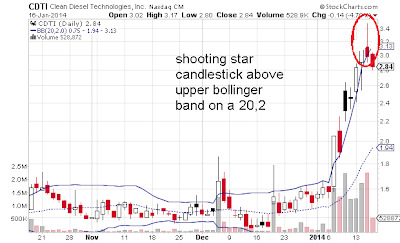 It is up this month from $.80 a share to $2.24 currently. It barely even traded any shares before November. It also has zero revenue. Buy volume is getting exhausted. ZLCS ran all the way to 2.25 intraday, however, I wasn't watching it during the day and missed any opportunity to lock in a profit. It subsequently reversed and closed lower. 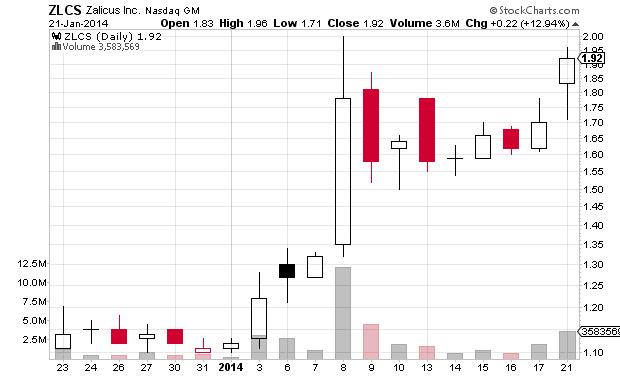 This is very bad price action for a breakout and I will be selling ZLCS tomorrow on any weakness. It will be about a 7% loss. UCO alternatively is acting very nicely and I plan on staying long this for some time. I'm long a couple position trades. 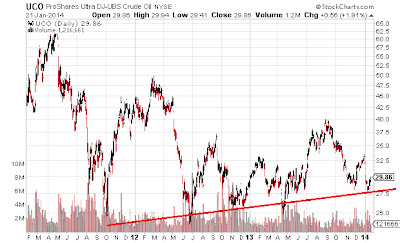 After stalking oil for awhile I put a buy stop for UCO the oil ETF in at 29.75 a share a couple days ago. I got filled on UCO and am now long. I'd like to keep this on for weeks. I also bought ZLCS a pharma company. I got filled in the 1.90s a share. Couldn't have asked for a better print on the day. A nice hammer. I expect this to run a lot after it hits over 2.00. One predictable chart pattern to short sell is an over-extended run followed by a red (loosing day) that prints a shooting star candlestick. I circled the shooting star in the chart. 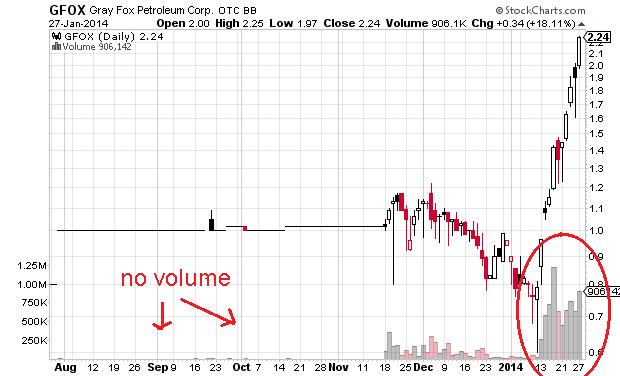 By an over-extended run I mean a stock that gains over 50% or more over about 5 days. 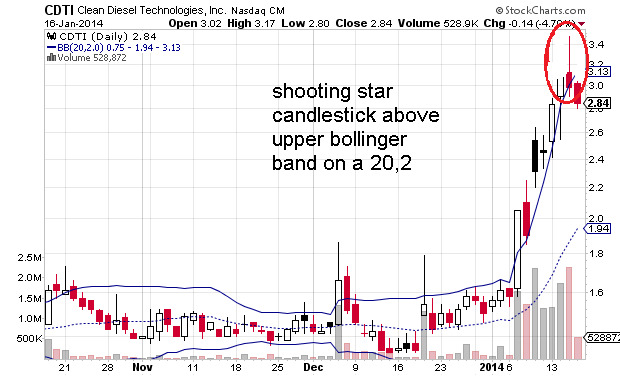 The classic setup is when it moves that much and also finishes above the upper bollinger band. A breakdown from the previous days low is a great short sell entry. CDTI was an almost textbook example of such a setup. 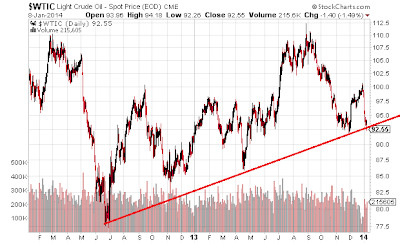 I have a buy stop set for Powershares Ultra crude Oil UCO at 29.75. To start I will do a recap on some of the stocks I've posted on lately. One that continues to surprise is Plug Power PLUG. I posted it when it was around $1.75 a share. It printed $4.90 today! ETRM followed through too. Interestingly enough Delcath Systems DCTH bottomed out around net current asset value. Now on to crude oil. There is a long setup now as it is back on trend support. 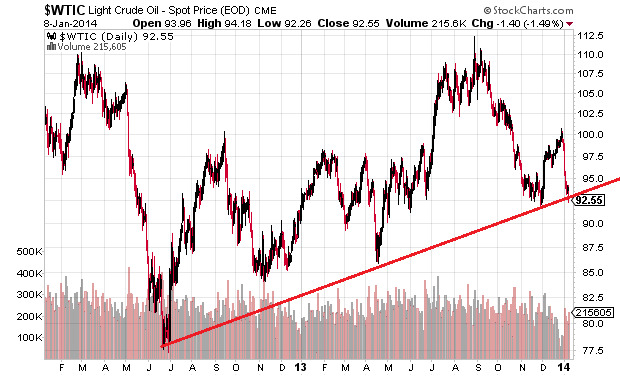 When it comes to crude we have to be bullish right? For starters there is the inflation piece. 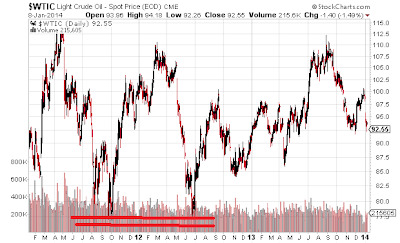 Over decades the majority of oil's gains are attributed to inflation. Will there be inflation short-term? I definitely believe so. With more dollar debasement on the horizon I think inflation is more likely here than deflation. Let's even say one drinks the FED's Koolaid and would rather go on CPI, M1 or M2. Still looks like inflation to me. Unemployment is down and the economy is a little better. 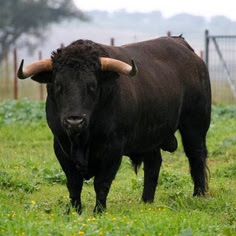 So I think the fundamental bullish case is sound and the long setup is here again in the charts. We are back on trend support folks. It will be interesting to see how the price acts around trend support here but this is still a long setup whether the signal fails or not. Now a slightly longer-term chart. You can see the rock solid support. 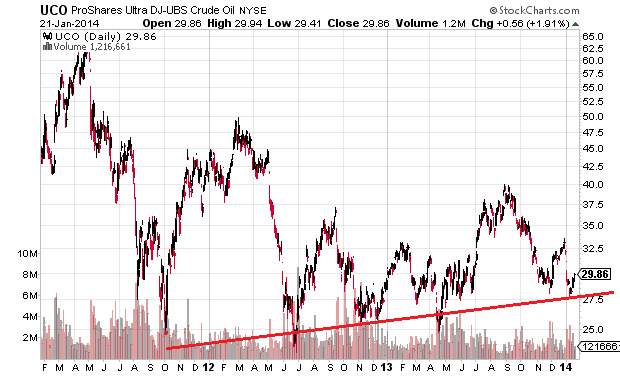 Vehicles to trade oil include the futures outright CL, ETF's USO and USL. USL has longer contracts so there is less decay than USO.